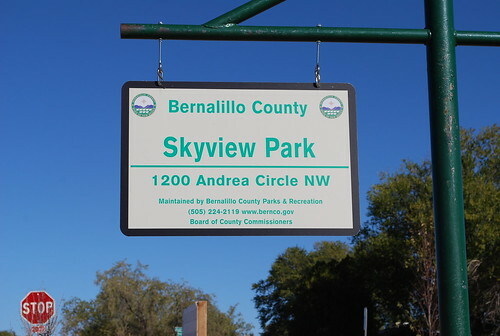 Commissioner Lonnie Talbert, former state Rep. Paul Pacheco, Bernalillo County Parks and Open Space Planning Manager John Barney, the Skyview Neighborhood Association and other guests debuted the new Skyview Park during a ribbon-cutting ceremony Nov. 2. Skyview Park is the little park with a big heart. That big heart is held by the Skyview Neighborhood Association who have worked so hard and diligently to make this park a reality. The area in the center of Andrea Circle was donated to the county as a park in the early 2000's. It remained undeveloped over the years - just cleared of weeds once or twice a season. In the spring of 2015, the Skyview Neighborhood Association called the county and asked what they could do to get the park developed. The Skyview Neighborhood Association came to the county’s PROS plan final meetings and filled out surveys en masse! In late 2015, they talked to state representatives and secured $60,000 in New Mexico 2016 legislative grant for materials for the park. Bernalillo County matched funding with $15,000 in impact fees and commitment of labor for design and construction of the new park. The final design was completed by Shelly Michalski, OS Intern. Construction began in January 2017. Members of the Bernalillo Public Works and Land Management staff worked many hours to develop and create this park. Construction was completed in October 2017, although in the coming year, the county will add a few more items to Skyview Park. These include a public art piece, some carved gateway structures, benches, a curb and some striping. To view a slideshow of the park and ribbon-cutting ceremony, click on the image below. Cielo Vista Neighborhood Association requested that the county-owned, but undeveloped, Cielo Vista or Andrea Circle Park become a xeric pocket-scale neighborhood park with a gathering space, paths, shade tree plantings, public art and monument sign for the neighborhood. In addition, the design of the park will alleviate drainage issues that have affected neighboring property owners. Several neighborhood and public meetings were held in 2016 to finalize the design. During the 2016 legislative session, the State of New Mexico appropriated $60,000 for the project. Because of the limited budget, the county will be completing project largely with internal staff. The neighborhood association has agreed to assist with some of the ongoing maintenance needs.